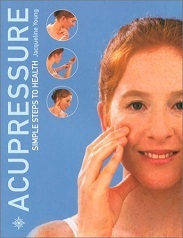 Acupressure Simple Steps to Health by Jacqueline Young was originally published in 1994. My copy is the 2001 edition. Jacqueline Young is a practitioner of Oriental medicine who spent many years training and working in the Far East. She now teaches, lectures, and writes about traditional health techniques and natural therapies. I enjoy experimenting and sharing with clients the benefits of acupressure.. Acupressure can open the flow of energy that is currently disrupted and help bring the body back to balance. I refer to this book because it is so easy to follow and understand the techniques used for designated treatments. If you have a strong interest in learning more about acupressure, I highly recommend shopping your local Half Price Book Store for a copy. Location: In the middle of the palm between the bones leading to the index and middle fingers. Can also be located by bending the middle finger inwards until it touches the palm. Technique: Support the palm with the fingers of the opposite hand and acupoint with the with the thumb. Apply acupressure angled slightly towards the middle finger. Repeat on opposite palm. Benefits: Calms the mind and reduces mental agitation. The LU 11 Acupressure is very effective in calming agitation and restoring mental clarity. It can reduce dizziness, body temperature, and help with breathing problems. You find LU 11 on the outside edge of the thumb at the cuticle, which is the final point along the Lung Meridian. Support the thumb in the fingers of the opposite hand and apply Acupressure using the nail of the opposite thumb (or by using the eraser end of a pencil) on Acupoint LU 11 for about three minutes. Repeat on the other hand. More tomorrow on calming the mind and reducing mental agitation covered in Jacqueline Young’s book Acupressure Simple Steps to Health.